The very short visit of President George Bush caused inconvenience for local people, bearing in mind that most were not even given a glimpse of the most powerful man in the world. Apart from the massively increased Police presence, large scale parking restictions were in force from 8pm 20th November until 5pm 21st November, as well as road closures and other security measures to ensure the safety of our fleeting visitor. Sedgefield village also suffered the same fate, with similar restrictions in place. Residents of affected roads had to find alternative parking from 8pm Thursday, as no vehicles were allowed to park in these areas for 21 hours. This meant many people having to leave their cars a mile or more away. At least Trimdon people had the pleasure of watching the Presidents’ fleet of helicopters come and go. Roads in and out of the Trimdon and Sedgefield areas’ were closed completely or as needed, causing lots of local traffic disruption, with thorough inspection of people and vehicles near the Prime Ministers’ Trimdon home, and the roads around the Dun Cow at Sedgefield. Fortunately, demonstrators were in short supply at Trimdon, unlike the scenes at Sedgefield. President George Bush swept into Prime Minister Tony Blair’s Sedgefield constituency aboard his US Marine One helicopter. His aircraft and three others landed on a soggy football pitch at the back of Mr Blair’s constituency home Myrobella in the tiny village of Trimdon Colliery. Mr Bush, accompanied by his wife Laura, was met by Mr Blair and his wife Cherie and the couples stopped to chat to neighbours as they made their way into the house. Two Sikorsky helicopters from the US Navy’s Black Stallions Squadron heralded the arrival of the President and his entourage, their powerful downdraft sending leaves and sprays of mud swirling across the soccer pitch, which was ringed by hundreds of British police. 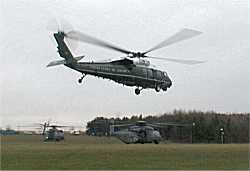 Mr Bush followed soon afterwards in his Marine One helicopter, met by a US Marine Colour Sergeant. Curious neighbours looked on through the windows of their houses, some of which were decked with Stars and Stripes and Union Flags. The village had been virtually sealed off to the outside world all morning in advance of the President’s visit, with police officers lining the streets every few yards. Mr Blair went forward to greet the President with Mrs Blair, who was walking with the aid of a stick after she sprained an ankle recently. Wearing a white knee-length coat over a dark trouser suit, she carried a bouquet of flowers to present to Mrs Bush. Mr Blair was sporting a blue suit with a light blue open-neck shirt. The President, wearing a sports jacket and flannels, shook hands with Mr Blair as his wife Laura, wearing a light brown two-piece suit, was greeted by Mrs Blair. The two families were expected to spend about 45 minutes chatting together inside the house and in the garden, beside the myrobella plum trees which give the house its name. President Bush left Teesside Airport at the end of his controversial four-day visit to Britain. The American President and his wife boarded Airforce One just moments after arriving back at Teesside International Airport from a four-hour visit to Prime Minister Tony Blair’s Sedgefield constituency. Mr Bush left the presidential helicopter Marine One to walk the short distance across the tarmac to the steps of the presidential jet Airforce One. He was met by the guard of honour of police officers who had been on duty at the airport throughout the day, and also a number of US Air Force servicemen, who saluted their president as he boarded his jet for the trip to Washington. Within minutes of Airforce One clearing the tarmac of Teesside Airport, an identical Boeing 747, Airforce Two, was beginning its departure, with a number of aides and members of the press who had made the trip to England with their president. Earlier, on the soccer pitch behind the Blairs’ home, Mr Bush bade farewell to Mrs Blair with a kiss and an affectionate pat on the head before boarding his Marine One helicopter. Mr and Mrs Blair stood waving as the President’s helicopter and three others bearing the rest of his party took off into the afternoon sky. Even once the President’s helicopter was long airborne, the Blairs stood by their house, waving into the sky as the helicopter fleet made its way the airport. US President George Bush has returned home to Washington after a four-day state visit to Britain, which was overshadowed by the terror attacks in Turkey. On his return to the White House, Mr Bush said the trip had cemented the “special relationship” between Britain and the United States. He said it provided “the chance to continue our dialogue about how to fight and defeat terror”. “We have a special relationship with Britain and that relationship was reaffirmed during the three days,” he added. The President spent the last day of his trip in the Prime Minister’s Sedgefield constituency. The four-hour visit to the North East prompted the biggest security operation the area had seen, with 1,300 police officers at an estimated cost of £1m. The President and his wife Laura flew into the constituency aboard his US Marine One helicopter for a meeting at Tony Blair’s home in the village of Trimdon Colliery. Afterwards, the two men and their wives went for a pub lunch of fish and chips at the Dun Cow Inn in Sedgefield. While at Sedgefield Community College, the President repeated his vow to defeat terror in the wake of the Istanbul bombings. He also disclosed he had spoken to the Turkish leader to discuss the latest outrages and offer US help in tracking down those responsible.